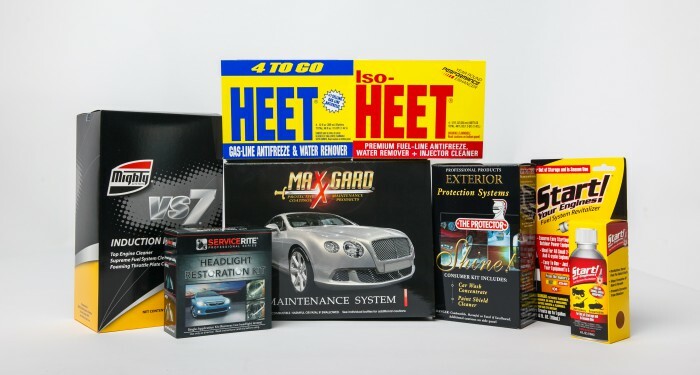 At General Converting, Inc., we've been manufacturing custom specialty packaging since 1982, and we have extensive experience in the design and manufacture of folding cartons to meet our customers' needs in car care packaging and automotive parts packaging. Our custom packaging for automotive products are made to the highest quality and will be exactly what you are looking for. Custom specialty packaging means exactly that at GCI, and all of our automotive parts packaging and car care packaging for automotive products are custom made to perfectly match the requirements of our customers. Custom packaging for automotive products can really make you stand out on the shelf. It might be high end wax and polish kits or an engine starting fluid product -- whatever the particular item, our customers come to us looking for custom specialty packaging that can carry their product with its own inherent message of quality and distinction. Automotive parts packaging and car care packaging clearly plays its own vital role in making a product stand out on the shelves from the competition and attract the attention of buyers. It also needs the correct level of toughness and durability to stand up to rough transport, varying environments and potentially long periods on the shelf.